There’s nothing profound going on here but an overheated, nasty, portentous, claustrophobic, woman-hating, slashing saga of domestic squalor. Repulsive Dad (Paul Rogers, poster-boy for the “Big Book of Bad British Smiles”) and his ignoble brother Uncle Sam (Cyril Cusack) share their parent’s house (the type of upstairs-downstairs horror seen in Coronation Street – you can’t tell where the gutter stops) with Dad’s two younger sons, morally crippled Ian Holm and borderline retard Terence Rigby. Home comes accomplished son Teddy (Michael Jayston) with his glamourous bride, Ruth (Vivien Merchant). ‘Home’ here is Pinter’s version of post-boom England, and everyone from outside enters at their peril. 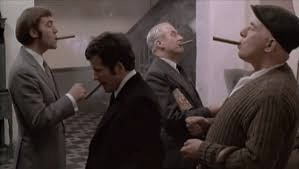 Filmed in brown, white and grey, it’s basically a fabricated gang-bang (the lads all share a box of cigars, the lads all share Ruth) and the whole thing descends into self-parody. Everyone declaims eloquently and emptily and nobody listens. What one salvages from the grotesque shambles of Pinter’s hypo-realism is the humour. Pinter helpfully described the story as being “about love” which might tell us something about Harold.